NRAMM dissemination activities include publishing on all aspects of the research supported by the Resource including technological development projects undertaken in the TRDs, as well as biological projects associated with the DBPs and CSPs. NRAMM has been acknowledged in ~270 papers. NRAMM personnel regularly participate in seminars, meetings and workshops and are active in a variety of community efforts, including the EMDB Map Validation Challenge, the CTF challenge (Marabini, Carragher, 2015); as well as workshops (Henderson, Sali, 2012; Patwardhan, Carazo, 2012) and other efforts (Cheng, Henderson, 2015) to establish standards and validation. NRAMM continues to disseminate our two major software packages, Leginon and Appion. The software packages are distributed under the Apache-2 Open Source license and we do not require users to register or seek permission to use the packages. 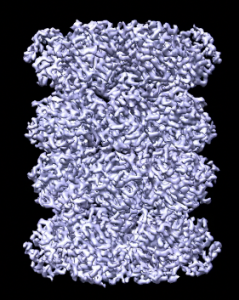 We also continue to release a number of annotated and partially annotated datasets for public use including recently the dataset that contributed to the 2.8Å map of the 20S proteasome. This dataset was uploaded to EMPIAR and was used for the EMDB Map Validation Challenge.